Native North Carolinian Dan Locklair enjoys a position of prominence among living composers. Trained as an organist and church musician as well as a composer, Locklair has produced a substantial catalog of symphonic, chamber, vocal, choral, and instrumental works, an opera and a ballet. His works are performed by leading ensembles and musicians throughout North America and Europe. They have been recorded by numerous labels. Locklair is currently composer in residence and professor of music at Winston Forest University in Winston-Salem, N.C. This recording features a cross section of Locklair’s sacred choral music. The 14 works set texts taken from a variety of sources, representing the span of the liturgical year. In every instance, the composer carefully reflects the inner, spiritual essence of the text, imparting the wide array of inherent emotions through his remarkably versatile arsenal of compositional techniques. The central work on the recording is Gloria, a nearly 15-minute work that captures many of Locklair’s divergent techniques as they reflect each section of the test. It is set for SATB chorus divisi, brass octet, and percussion (two players). It opens with a spirited brass and percussion introduction. The singers then begin in a conservative choral style, processing from the rear of the space, representing the angels descending from Heaven as they deliver the Good News. This is but one of many ingenious touches that bring the text to life, drawing the listener in. Soon, Locklair’s trademark vibrant, rhythmic style comes into play as the opening words are exuberantly repeated, the full chorus exuding the people’s joy. Each succeeding succession ushers in a differing style and expression as the text unfolds. Under Malcolm Archer’s direction, the Winchester College Chapel Choir and Portsmouth Grammar School Chamber Choir, with brass and percussion, brilliantly perform this technically and interpretively challenging score with assurance, precision, superb intonation and balance, a palpable joy. The remaining works are performed with equal excellent and elegance by Sospiri under the direction and professional ensemble’s cofounder Christopher Watson. Some are a capella (The Isiah Canticles, En Natus Est Immanuel, O Sacrum Convivium, Ave Verum Corpus, Pater Noster, The Lord Bless You and Keep You); others are accompanied by organ, adroitly played by Jeremy Cole (Lord Jesus Think On Me, Angel Song, Ubi Caritas). Two include solo trumpet in addition to organ (St Peter’s Rock, Remembrance). Locklair’s music has been described as “eclectic”, although it transcends simple classification. 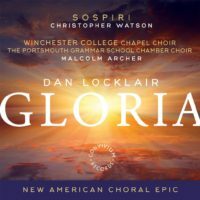 For those who are primarily familiar with Locklair’s organ works, this recording will be revelatory, displaying a wealth of creative diversity that ranges from contrapuntal, rhythmic, and tonal complexity to plaintive or stately sonorities reminiscent of Arvo Pärt of the English cathedral tradition. While the influences are extensive, Locklair’s own inimitable style pervades throughout. From the brief loveliness and simplicity of The Lord Bless You and Keep You to the multifaceted expression and complexity of Gloria, this is music of enduring substance. It is deeply impactful, making an indelible impression. That it has been enthusiastically received by an international audience proves its intrinsic appeal that transcends local culture. This beautiful recording belongs in the collection of every lover of sacred music. It will also serve as an inspiration for choirs and conductors wishing to discover the riches of this music for themselves and share it with their congregations and audiences. The American Organist magazine (TAO), published monthly by the AGO, is the most widely read journal devoted to organ and choral music in the world. It is the official journal of the American Guild of Organists and the Associated Pipe Organ Builders of America.